My mom. Almost every year. And yet, I never remember small Christmases. Perhaps they were small in comparison to the expensive gifts or the multi-hundreds of dollars in cash and gift cards our classmates talked about receiving each year. But even then, I just found it odd that they received so much. Some of the early Christmas photos of my family show our tree in the background – an 18” high green ceramic tree with colored pegs that glowed from a light bulb stuck inside. We put our gifts under and around the small table it sat on. We hung garland in a scallop from the ceiling and hung our ornaments from that. I remember being particularly enthralled by the ornaments and how certain I was that no one else decorated for Christmas in quite that spectacular way. Blame it on my steady diet of Little House on the Prairie and The Waltons, but I was just genuinely the kid who was (mostly) thankful for what I had. I thought of Laura Ingalls treasuring her tin cup and peppermint stick for Christmas and I knew our celebration was lavish. One year, there was a knock on the door and I answered it to see Pastor Bill standing there. He asked for my parents and then gave them an envelope. “This is for Christmas” he said. Inside – money for gifts for us and food for Christmas dinner. Mom tells me that was the difference between having those things and not that year. But most years weren’t like that, at least not that my memory recalls. On a summer Saturday when I was about six or seven my mom and I woke up early to track down garage sales in our town as we often did. At one we found a treasure – an artificial Christmas tree selling for cheap. The top part that makes the point of the tree was missing, but we got it anyway. That next Christmas the tree earned the affectionate nickname “Stumpy.” We bent the branches of the top layer up and into a point and stuck the red Christmas angel on top. 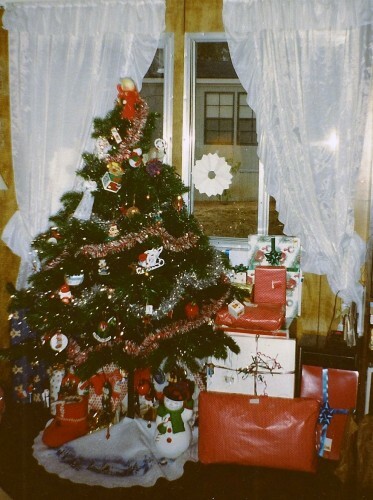 As a child, the tree seemed massive, but it didn’t even come to the top of the window. Stumpy one year with presents piled around. On the day after Thanksgiving we’d get out our ornaments and hang them on her branches one-by-one, telling the story of each ornament. Mom bought us a new ornament each year – something that represented our year. They were our travels, our dreams, our interests, our talents. There were curled papers covered in glitter that had resembled angels at some point. Hallmark collection figure skaters. Silly snowmen. Model cars.The ornaments were the stories of our lives and Stumpy held them well. As much as I had loved the ornaments hanging from the garland on the ceiling, I thoroughly embraced and enjoyed our upgrade to Stumpy. We eventually got rid of Stumpy when I was around 11 years old and bought a brand-new artificial tree. This tree had full, fluffy branches, a top piece that scraped the ceiling in our short-walled living room, and no name. I suppose I would have done the same thing as an adult, but as a kid I missed Stumpy. She was part of my Christmas, part of the magic and wonder that we found such a treasure. She was short enough that I could reach the tip top and stick the angel in her place. Stumpy was enough for my child-heart. And really, Stumpy was more than enough. The scalloped garland hanging from the ceiling and the ceramic tree on the end table were enough. I was better at it as a kid, but I still strive to maintain that seemingly unshakeable contentedness. I’m currently the poster child for the boomerang generation: 30-something. Grad degree. Back living with my parents. I’m working and my business is growing, but money is tight. As I’ve struggled the past 18 months with the fact that this is my reality, I’m constantly reminding myself that this is enough.I have parents gracious enough to accept my home-cooked meals and contributions towards the utilities as rent. I have a bed, a dresser filled with clothes, a car that runs, a cabinet full of food, and a computer on which to make an income. My life is a little haphazard. If I compare my current reality to the dreams, my life seems to be missing that crowning piece that makes it look complete. But, I know, what I have is more than enough. This entry was posted in Money & Place and tagged adulthood, celebrations, children, Christmas, contentment, grad degree, holidays, memories, money, parents, traditions. Bookmark the permalink.